Today was another fantastic day of seeing biology at its best. I had the opportunity to observe the dissection of a sharpnose shark. It is a small shark (about 2′ long) and rather docile, so it has been a good shark for me to practice on learning how to handle sharks. The Chief Scientist works with many other scientists who are researching the reproduction of a variety of sharks in the Gulf. Although this species of shark is not the one that he is researching (he is researching the blacknose shark), shark colleagues throughout the Gulf work together in order to obtain as much data as possible, and therefore collect data for one another. Scientists look at the reproductive stages by observing and performing tests on the reproductive organs. 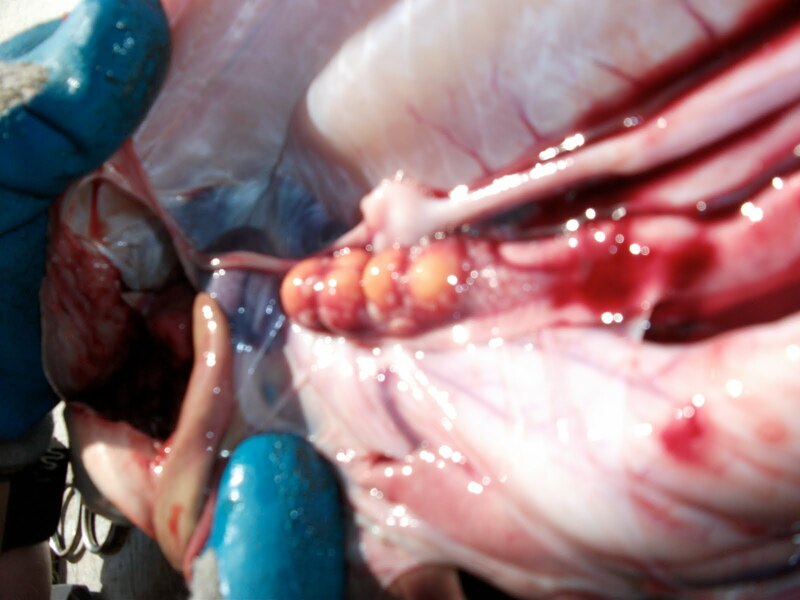 The shark dissected was a female in advanced puberty, but was in the process of collecting developing eggs. The samples taken on this shark were the follicles, where the eggs are stored, a piece of tissue and a blood sample. They will be taken to the NOAA lab in Pascagoula for examination. Yellow follicles where eggs are stored. One recent finding on the blacknose shark study is that it was thought to reproduce annually. The Shark Scientist has recently found samples of blacknose sharks that show some reproduce biennially and some annually. This came about by looking at the physical features and chemical makeup of the sharks. The Chief Scientist stated that they will need to go back and review all of the data they have collected on these sharks over the many seasons they have been conducting the bottom longline survey. The reason why this is so important is that the federal regulation of the catch is based in part on this data. The outcome could be that the shark population is being depleted at a faster rate than was expected or the population is larger than anticipated, which means the catch regulations could be changed to reflect that. The shark biologist and the shark endocrinologist ( researching the hormonal makeup of sharks) were both sure that their data was accurate and valid, yet their results contradicted one another. As you would hope, these scientists are open-minded enough to review their findings again and will try to solve this unexpected puzzle. There is a great deal of data that is collected during these types of surveys. Some data is recorded with pencil/paper, other data, such as that collected with a piece of equipment called a CTD (for “conductivity”, “temperature”, and “depth”), is recorded with computers. The actual measurements of sharks are written with pencil/paper, but once each station is done, the information is entered into one of the computers that are in the dry lab. There are six computers in the dry lab, 2 of which are laptop computers called Toughbooks. The Toughbooks are used when the hi-flyers, weights and numbered tags are put out on the fishing line and when they are hauled in. They are recording the position and time each twelve foot line is being dropped into the water. CTD lowered into the water. The CTD is an extremely expensive and sensitive piece of equipment that is placed in the water immediately after the crew and scientists have finished setting the longline. 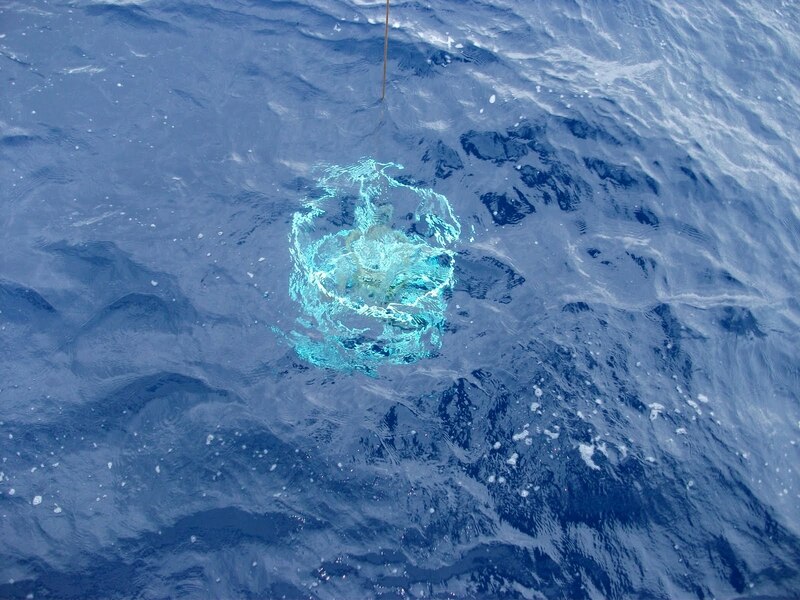 The CTD sits below the surface for 3 minutes and is then lowered nearly to the ocean floor. The crew needs to be careful not to let it touch bottom because it can damage the sensors causing the unit to fail. All of the data from this equipment is analyzed by the Chief Scientist when he returns to the lab. There are also computers in many offices on the ship. As of this writing, I have not had the opportunity to explore what their functions are. That is for another day. It is incredibly hot here today and I have not adapted very well this week. For a person who is always cold and who rarely sweats, it is quite a surprise to have sweat dripping from everywhere. I even had sweat dripping from my forehead into my eyes! That is not fun. Although I do not generally drink Gatorade, I am drinking a lot of it on this trip! I really am not complaining, just making a statement. I am really having such a great time on board this ship. It truly is a once in a life time experience. In the past couple of days I have had the opportunity to interview the five scientists (which includes the shark scientist) that I work with, and the captain of the ship. Their backgrounds are very different, but they all agreed that their love for the ocean has always been there. The also all stated that while in high school, there were not marine biology classes. It was not until they were at the college level that there were course offerings in their area of interest. The shark scientist has a PhD., but the other crew members do not. They are planning to work on their master’s degree in the future. All of the crew have set goals for themselves and I am sure they will achieve them. Each one gave advice to my fifth graders and that is do what you love. I really enjoyed spending time with all of them and have a lot to share with my students and teachers when we are back in school. 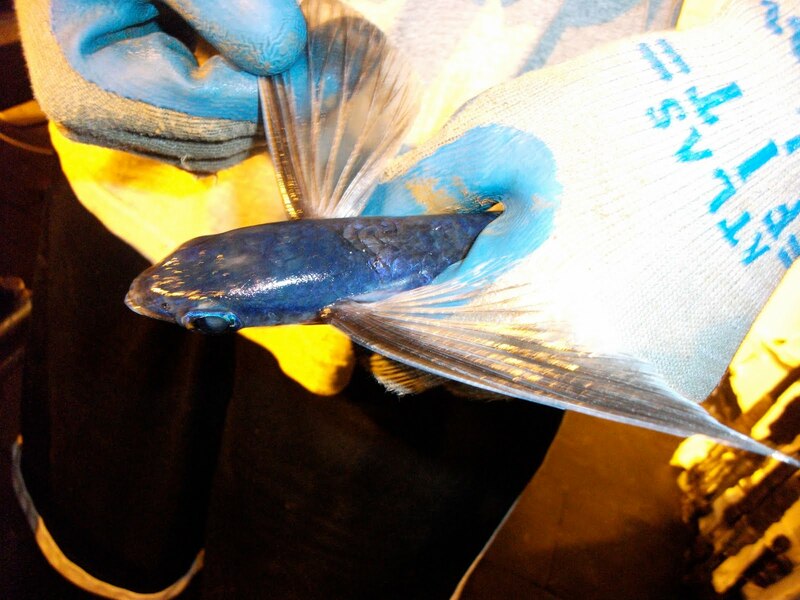 A flying fish caught in the night. The answer is yes. There is this wonderful little fish that swims very fast under water, but will fly or skip like a rock over the water. It is a great adaptation that helps it to survive because the dolphins just love to feast on them. Often times where there are flying fish, there are dolphins. The other evening a flying fish flew out of the water and bounced off one of the crew members who was walking to the bow. One of the volunteers, who happens to be from UNE, caught it. That was so amazing in itself and getting to see it upfront was even better. Another example of the wonders of the ocean. How do captains and crew members communicate with ships that are far away? 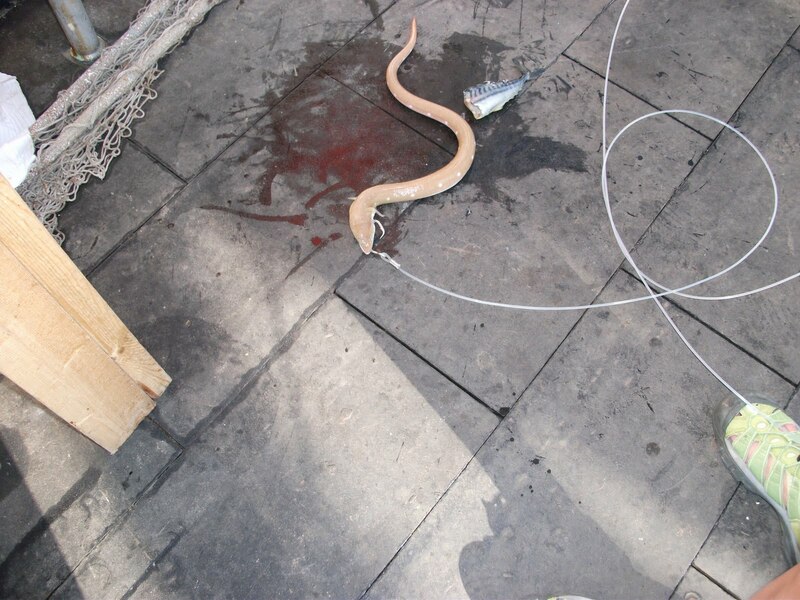 “Animals Seen Today” a pale spotted eel that has very sharp teeth and bites. 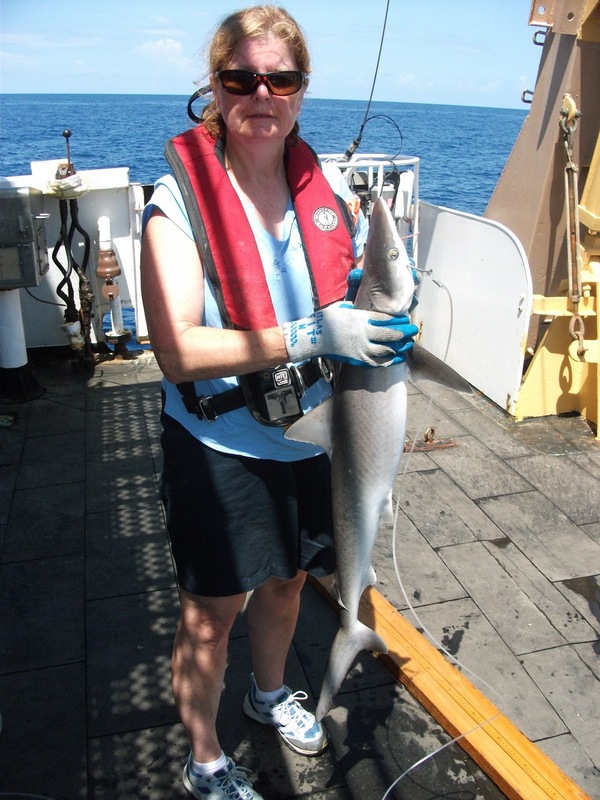 This entry was posted in 2010, Annmarie Babicki, NOAA Teacher at Sea and tagged Biology, CTD, flying fish, Gulf of Mexico, longline survey, red snapper, shark. Bookmark the permalink.